Savvy Southern Style : Thanks So Much! Thanks so much to every one who joined my first Wow Us Wednesdays party this week! Wow is right! Over 172 links so far and it is still going. You can join here. I just wanted to share some of the awesomeness from this week's party. There is a great tutorial on how to achieve the look of this bag at House Revivals. Wonderful bird art created from a calender at Curly Willow diy. Check out how Debbie channeled Donna and transformed her son's room at Debbiedoos. Some more mod podge love going on over at Evolution of Style. Great colors used on this chest at Chrissie's Collections. 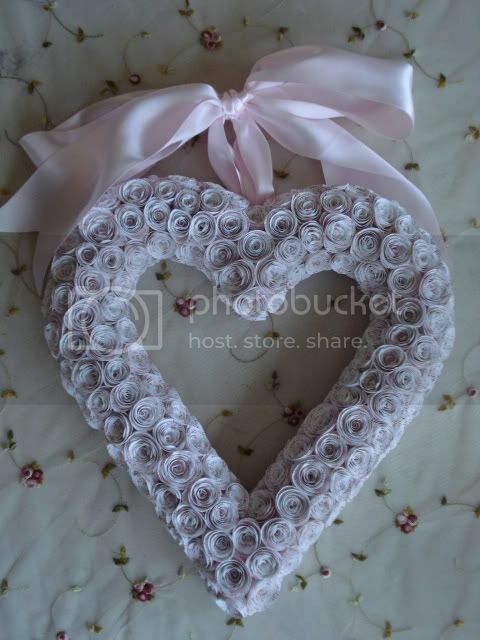 At Enchanted Rose Studio you will see two lovely paper roses wreaths. This was a lot of hard work, but so worth the outcome. Check it out at In Stitches. some more in a couple of days. If you were featured here you can grab a featured button from my sidebar. Thanks again for the wonderful turn out to the first party! Thanks for sharing -- I was definitely wowed on Wednesday by all of the awesomeness out there in blogland! Thanks for sharing some snippets from your Party. My mom had surgery, so I missed it, but I am definitely going to check them out. Have a wonderful day and thanks for your inspirations. Thanks for the feature! So many great ideas out there - going to check them out! These are wonderful Kim. I'll come back later and have a look at the other links. Oh Kim, you have definitely shared some "WOW" features from your party. Thanks for sharing. Sorry I missed your Wow party. I never know what to feature. Anyway you had quite a party! I'll try to join next time. You had quite a party, Kim!! Lots and lots of inspiration. Thank you! Thanks so much for your nice comments about my kitchen and also for letting me know about linking to my post and not my comment section. My post received a lot of views and some very nice comments which is exciting and encouraging for a new blogger. Thanks again! How exciting to have had such a successful new party launch. I just posted another project so now your number is a bit higher. THank you for hosting such a wonderful party. There were so many amazing things! Thank you for letting me know to link up on my post. I will figure it out for next time. Kim, thanks so much for including photography in your new party...it lets me participate more often and hopefully word will get out about a new place to show our photographs. Thanks for visiting and enjoying my sunrise...it was awesome!!! Have a sun filled day!!! Wow is right Kim, you've got some wonderful talented girls posting your party. Thanks for sharing a few and congratulations on the success of your first Wow Us Wednesday party. So much talent out there ...I'm amazed everyday!!! Any time now, the freight truck with all of my incomplete painting projects should be pulling up to your doorstep. Please do that pretty little thing you do and ship back to AZ. at your earliest convenience. Thank you. Yes, I've been wowed! So many talented women out there. Linking to your party allowed me to connect with some really great ladies. I'm honored to be included in all this awesomeness! Thanks. I'm new to blogging and just found out about your link up party from another blogger I found by accident. I'm finding it quite overwhelming how much TALENT there is out there! What us women can do with very little, and yet make gorgeous just blows me away! I will have to finish off something to join up for next week!